You are such an imaginative child! I can see you right now, sitting in front of the fire place while a whale, shark and fire truck are being brought to life by your creative mind. At 19 months, you have taken great interest in marine animals and vehicles. Our days are filled with fins, tails, barnacles and monster trucks! 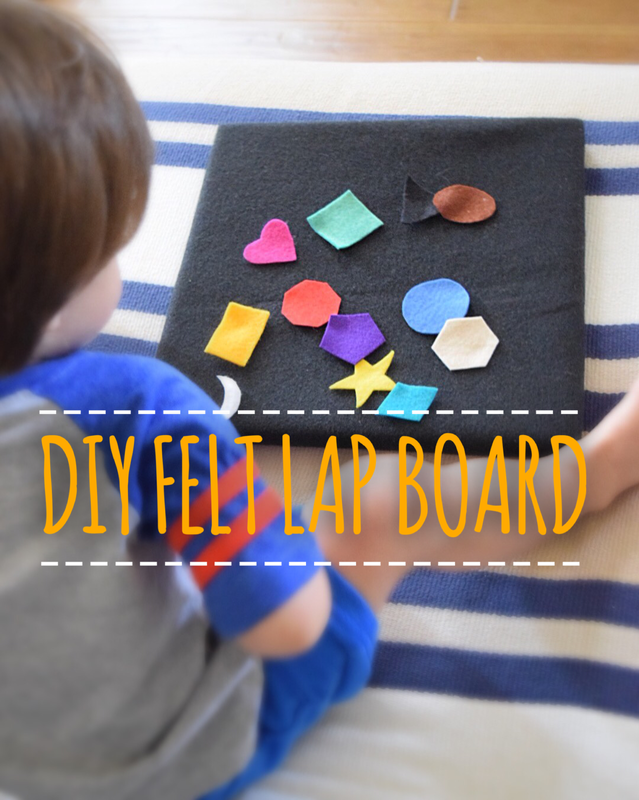 I wanted to let your imagination run wild with a new craft, a felt lap board. I created four scenes for you to build. Your favorite, of course, was the ocean. You made friends with felt whale and felt shark and splashed them all around the house. With the landscape scene you liked the little pink flowers best. In fact, flowers are a recent interest of yours. You will pick flowers just about any chance you get, and it’s the cutest thing when you raise one to your little nose and take a big sniff. 😊 Basic shapes and colors were a big hit. You spent quite some time sorting and naming them. And lastly, for fun, we built ice cream, yet another recent interest of yours. You loved stacking and separating the flavors. This project was fun for both of us and as a result I see us spending a lot more “lap time” together. A Mother’s Dream! Note: This post contains affiliate links from Amazon. Be sure to read my full disclosure here. First, build the lap board. Use scissors to cut the large piece of felt to measure 13 in x 13 in. Lay the canvas face down on the felt, then wrap the felt around the canvas and use the staple gun to attach. Proceed to staple all around the canvas, avoiding the corners. Next, fold the corners in tightly and staple a few times to secure. Trim excess fabric. Voila! Now comes the fun part! Make a list of “scenes” your child might like to build. Sketch outlines or print templates of your pieces and trace onto your felt. Cut and hot glue any layered pieces. The possibilities are endless with this craft! Check back with us as we create more scenes, I already have lots of creative ideas, imagine that! I’d love to hear your ideas! What scenes would your child like to build? RELATED: DIY Race Track & Parking Garage.